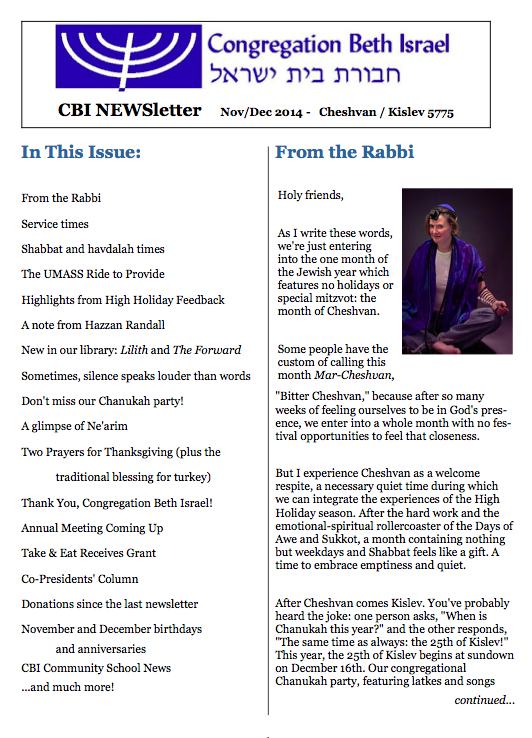 The Cheshvan/Kislev 5775 (November/December 2014) Newsletter is Here! Those who are on our email list will receive a digital copy via e-mail shortly. Those who don’t have access to email, or who have specifically requested paper delivery, will receive a paper copy in the mail soon. Shavua tov! Looking forward to Shabbat Lech Lecha. 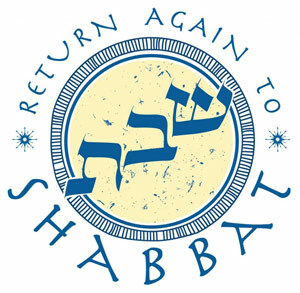 This Shabbat, our shaliach tzibbur (prayer leader) for morning services will be Rabbi Rachel. I live on the island of Martha’s Vineyard with my husband Matt Pelikan (a restoration ecologist for The Nature Conservancy) and our cat Pitzi. I am studying in the ALEPH: Alliance for Jewish Renewal Rabbinic Ordination Program. I’ve been an educator for more than 20 years and currently write English and History curricula and teach teachers in content institutes. Areas of expertise include curriculum design and alternative assessment, Shakespeare and World and American History. I am currently writing curriculum on Jewish Women in the Labor Movement for the Jewish Women’s Archive. I occasionally also work as a personal chef and a meeting facilitator. I enjoy being outdoors walking, running, cycling, hiking and gardening, and I am an active member of the Martha’s Vineyard Hebrew Center. This coming Shabbat will also herald a new moon and new month, the Jewish month of Cheshvan. We’ve come a long way together over the past seven weeks: the internal and interpersonal teshuvah work of the month of Elul, then the Days of Awe, then Sukkot which culminates in Shemini Atzeret and Simchat Torah. These last seven weeks have been a kind of “time out of time” — an opportunity to journey together on one of Judaism’s sweetest and most intensive paths. And now it’s time to sigh a deep breath of release, and return to ordinary life. This Shabbat is Shabbat Bereshit, the Shabbat when we will read the very first parsha in the Torah, with those famous opening lines “In the beginning God created the heavens and the earth…” Or perhaps it’s “As God was beginning to create the heavens and the earth…” Or “With beginning, God created the heavens and the earth…” The Hebrew is rich and supports a variety of readings. One way or another, we’re starting at the very beginning — which, as fans of The Sound of Music know, is a very good place to start. Join us tomorrow morning for Shabbat services at 9:30. We’ll read from parashat Bereshit and sing our usual Shabbat melodies together. During Torah study, we’ll explore some texts about beginnings. One small piece of practical business: next Thursday we are scheduled to have an event called “Compassionate Listening: Israel, Gaza, and Us.” We will break into small groups and enter into a process of listening to one another, facilitated by me and by a local therapist, in which the goal will be to express our feelings, fears, and hopes after the summer’s Israel/Gaza war and to appreciate the diversity of opinions within our community. We need at least a minyan in order for this program to run. If you are planning to come to that program next Thursday, please RSVP to the office (office at cbiweb dot org) by Monday midday. Wishing you blessings as we approach Shabbat Bereshit! Chag sameach – happy Sukkot! Tonight at sundown we enter into the festival of Sukkot. After the hectic pace of the Days of Awe, Sukkot is a welcome opportunity to relax. The primary mitzvah of Sukkot is to dwell (or at least dine) in a sukkah for a week and to rejoice there. Sukkot is a harvest festival. In antiquity this was one of the three great pilgrimage festivals when our ancestors would have taken the fruits of their harvest to the Temple in Jerusalem to offer them to God. Today we harvest memories, emotions, and experiences. What memories from the High Holidays do you want to bring with you into the sukkah this year? Sukkot is an opportunity to remember the Exodus from Egypt, as the sukkah is meant to remind us of the temporary shelters in which our ancestors dwelled during the forty years of wandering. Sukkot is also an opportunity to reflect on what’s temporary and what really lasts. We move for a week into these flimsy little houses (which must have roofs made of organic material through which one can see the full moon and the stars) in part to remind ourselves that even a beautiful and stable dwelling is ultimately as temporary as a sukkah… but if we cultivate faith and trust, we can know ourselves to be sheltered beneath the Divine Presence, even if our structures / our lives / our bodies don’t last forever. And here in northern Berkshire, Sukkot is a glorious opportunity to enjoy the great outdoors during these beautiful days of fall. Thanks to a group of wonderful volunteers, CBI’s beautiful sukkah is once again standing behind the synagogue. “Our sukkah is your sukkah” — please come and take advantage of the CBI sukkah anytime during the coming week, day or night! Bring lunch to the CBI sukkah and dine there beneath the rustling cornstalks; bring dinner; bring your book group to meet there; bring a bottle of wine and enjoy the moonlight; even bring a sleeping bag and camp out if you’re so inclined! The sukkah is here for you. And, of course, I hope you’ll join us on Friday night for our Shabbat / Sukkot potluck. Please do RSVP to our hosts Heather Levy and/or Jen Burt so that we know how many people are coming and what people plan to bring. Chag sameach / a joyous festival to you! How were the holidays for you? Thank you so much for being a part of our community at this special time of year. Hazzan Randall and I both felt blessed and privileged to have the opportunity to lead you in prayer. The questions are enclosed below, but please don’t answer them here on the blog — you can answer them anonymously online at our survey. 1) What worked for you? Over the course of the Days of Awe — whichever services you attended — what did we do well? What did you enjoy? 2) What didn’t work for you? Over the course of the Days of Awe — whichever services you attended — what could we have done better? How could we make next year better for you? What one word would you use to describe how the High Holidays at CBI made you feel?